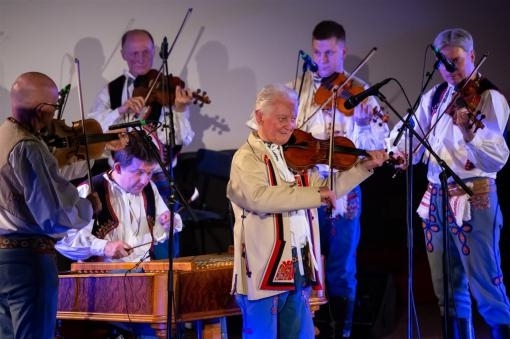 In an almost four-hour long programme, both audience and performers celebrated the 80th birthday of Horňácko folk legend Martin Hrbáč in Veselí nad Moravou. The concert that took place on Sunday 24 March, and was not only historic in its length but more importantly in the range of folk legends appearing on stage. 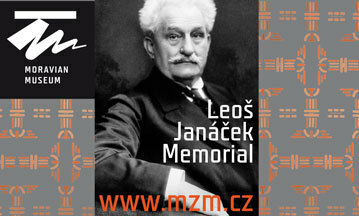 This marathon was staged by Czech Radio Brno and their musical dramaturge, who is also connected to this region. Petr Mička is most famous as a brilliant Horňácko leader and singer, though he has recently also convinced us of his good directing skills. In the two years at the radio he has created several unforgettable broadcasts. He is becoming one of the people interwoven with the folk programme of the Brno station, like Jaromír Nečas or Jiří Plocek. The evening was hosted with traditional humour by Břetislav Rychlík. The aforementioned creative duo Mička-Rychlík once again showed us how brilliantly they can work together. Martin Hrbáč, the “maestro” whose jubilee it was, showed incredible vitality and joy from both music and life, even leading a large part of the concert himself. He presented not only his contemporary young group, but also the former line-up. Among the singing well-wishers was Straňany singer Vlasta Grycová, who had the whole auditorium singing by the first half of the concert. Double bass player Jaroslav Smutný (85) conjured up a few smiles with his legendary ability to forget texts, beginning from the second verse even though he had a cheat sheet. Other gracious well-wishers were the men’s singing ensemble from Hrubá Vrbka together with the Chotár choir, the Oskoruša women’s choir, Musica Folklorica, Aleš Smutný, Martin Prachař, Veronika Malatincová, the singer Janíček Pavlík and his son Martin Hrbáč junior. In the second half of the evening, the Brno Radio Orchestra of Folk Instruments took to the stage. It performed with many variations with its current leader Petr Varmuža, who sometimes alternated with Martin Hrbáč. Miro Dudík, descendant of the Myjava bard Samko Dudík, also stood at the head of BROLN with his vigorous slide. In this case, it is nearly impossible to name all the performers and well-wishers who took turns at the podium. One cannot be surprised, since how else can you congratulate a musician in body and mind than with music. Horňácko is also a land of song and full of talent. It is actually fully possible that the four hours were too short. And so I add my wishes: Good health to you, Maestro!